Kate brought back a Jenny Packham gown for this evening’s gala at the Met. Above you see the Duke and Duchess arriving at the Metropolitan Museum of Art for tonight’s fundraising dinner. The black tie function is in support of the University of Saint Andrews 600th Anniversary. William is the Patron of that fundraising campaign, and the couple has participated in a number of events related to the anniversary. The 600th Anniversary fundraising campaign kicked off in March 2011, that occasion was one of Kate and William’s first joint engagements. 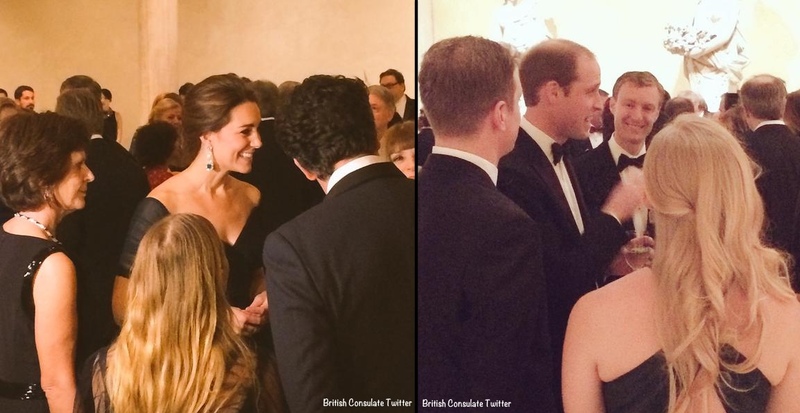 Kate and William mingling with guests. William’s cousin Princess Eugenie also attended the dinner. 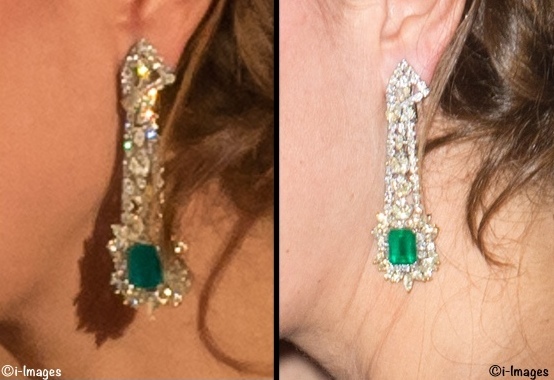 The most striking part of tonight’s ensemble: Kate’s glimmering, shimmering jewelry, better seen in this photo. 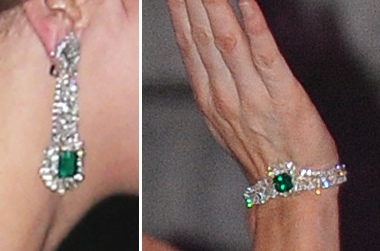 The diamond and emerald earrings and bracelet are a private gift. It is the first time we have seen the Duchess wearing the demi-parure, or partial set. The chandelier style earrings showcase several strands of diamonds with a large emerald, that emerald is also surrounded by diamonds. 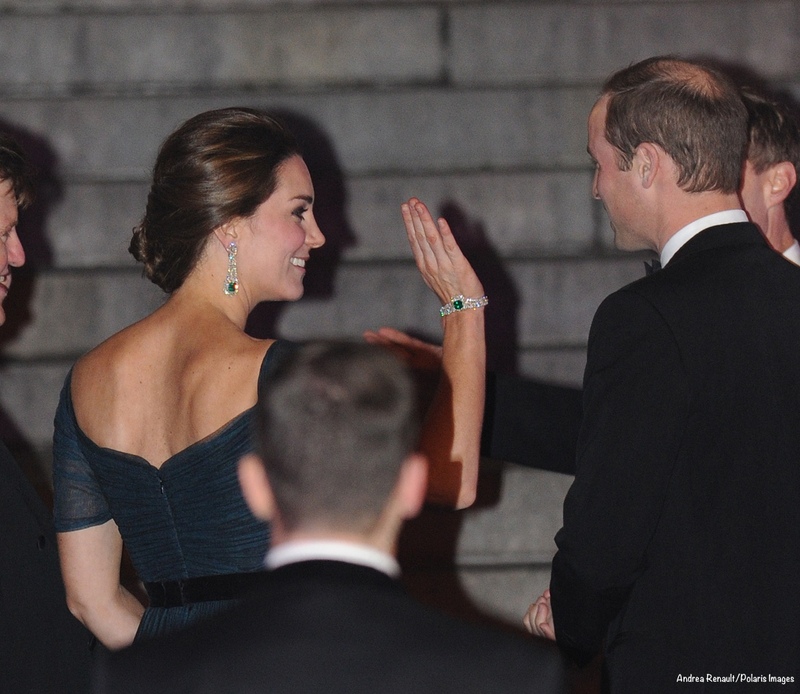 This offers a different angle, as well as a look at Kate’s updo. The bracelet echoes this motif, although these are not stellar shots of the piece. 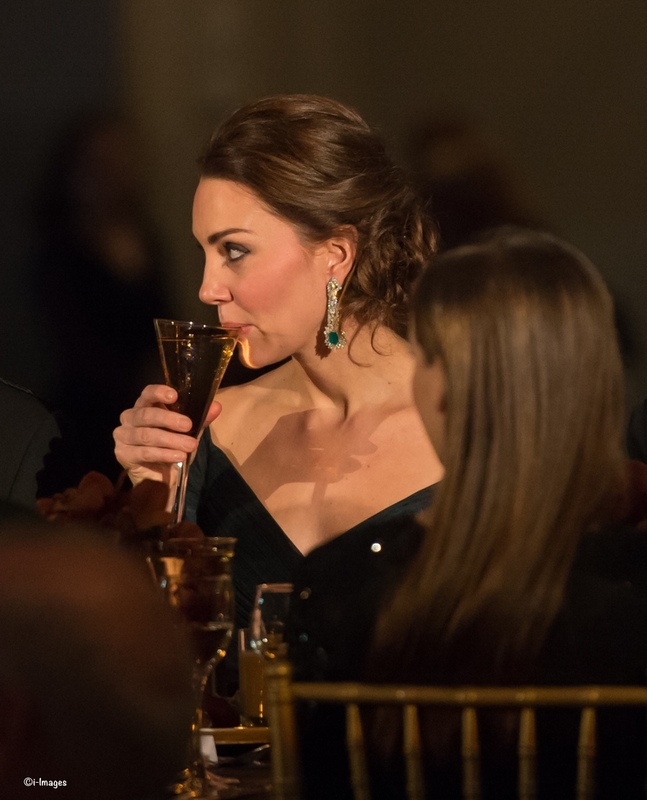 Kate most recently wore the gown to a National Portrait Gallery event in February 2014; the first time we saw it was for a 100 Women in Hedge Funds dinner in October of 2013. 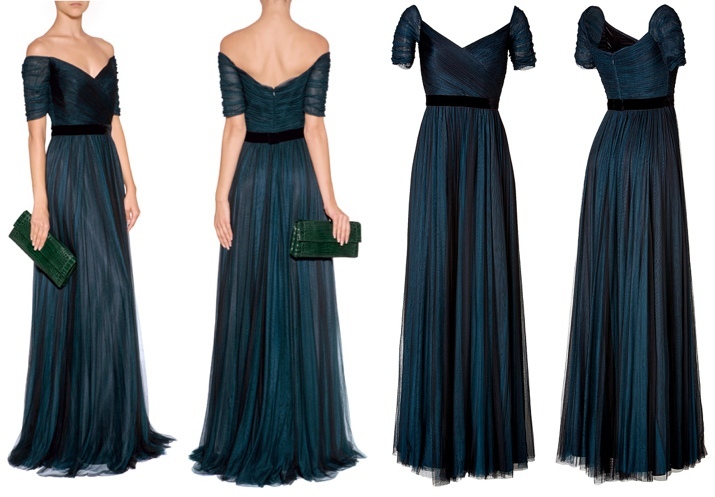 The gown is described as being made of “petrol-hued silk” on the Stylebop site, where it is still available for purchase in a US size 4/UK size 8. It is actually on sale for $2657, discounted 45% from its original $4885 price tag. Here you have a better view of it from the front. 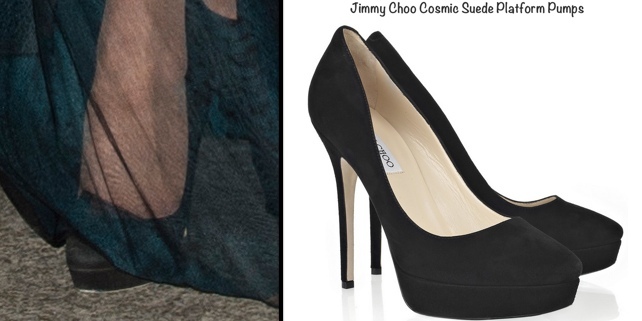 It appeared Kate was wearing her Jimmy Choo Cosmic heels, now out of stock at Jimmy Choo and everywhere else we checked. 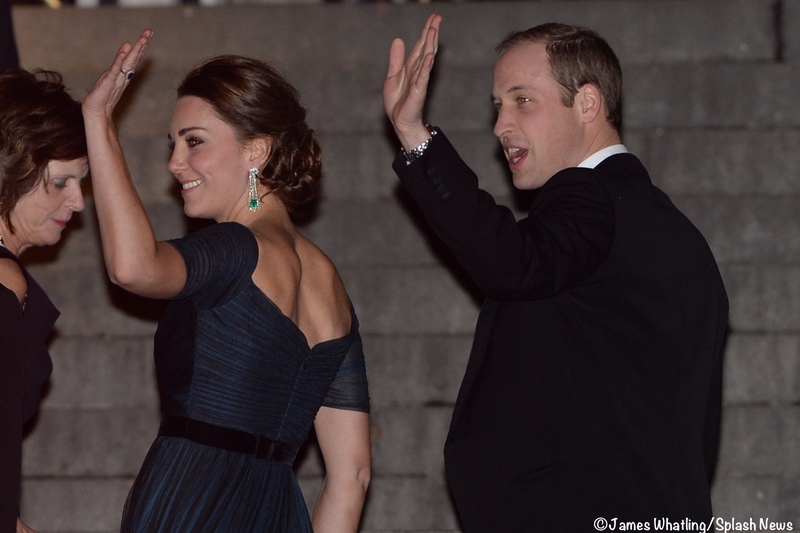 Below, the Duke and the Duchess leaving tonight’s dinner. William and Kate are flying home tonight.